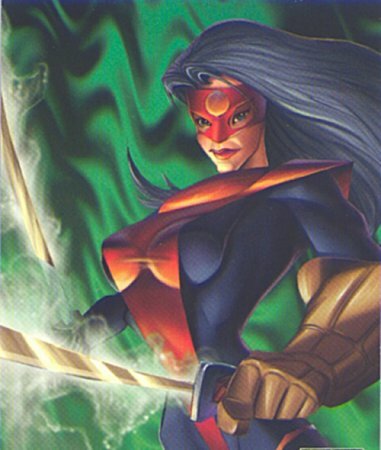 Powers/Abilities: Kokoro is a psionic metamutant with extensive training in the martial arts (including both Ninjitsu and Bushido) and always armed with her twin katana swords. Combining her psionic powers with Ninja training, Kokoro's katana blades are doubly deadly -- striking both a physical and mental blow to unwitting opponents. 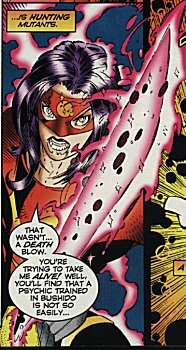 Her "psionic" swords are actually mystical blades infused with her telepathic powers and are powerful enough to sunder both demons from Apokolips and the Tyrannoids of Latkovia. 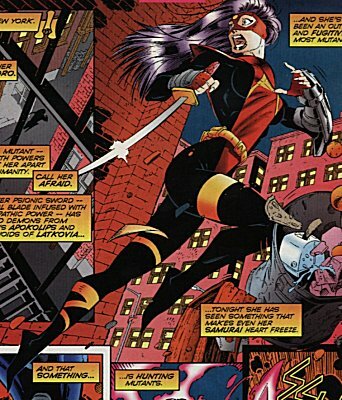 (Mutant Outsiders Annual #2) - Psionic metamutant Tatsu "Betsy" Braddock left her quiet home in England to travel the world and eventually became the sword-wielding mercenary known as Kokoro. Kokoro later befriended the other-dimensional alien spirit known as Haloroma and presumably joined the Mutant Outsiders. (Magneto and the Magnetic Men#1 ) - "Opposites Attract" - Kokoro was being hunted down in the streets of New York City by the advanced Sentinel robot known as Sinistron. When Sinistron finally attacked, Kokoro realized that the synthetic metamutant hunter was trying to capture her alive rather than kill her. Kokoro charged her sword with psionic energy and attempted to fight back against Sinistron -- but then the Magnetic Men entered the fray and forced Sinistron to retreat. (JLX Unleashed#1 (bts)) - Kokoro eventually became affiliated with Mr. X's JLX. A love triangle developed among Kokoro, Angelhawk (Warren Hall), and Nightcreeper (Kurt Ryder). MUTANTS OUTSIDERS ANNUAL is an amalgam of Marvel's NEW MUTANTS ANNUAL (Marvel's Psylocke debuted in NEW MUTANTS ANNUAL#2) and DC's THE OUTSIDERS. An other-dimensional alien spirit, Haloroma was imprisoned within a human host until she was set free by Kokoro (Tatsu Braddock). It is presumed that Haloroma later became a member of the Mutant Outsiders. Haloroma is an amalgam of Roma (the Omniversal Guardian) of the Marvel Universe and the Halo (Violet Harper) of the DC Universe. The Mutant Outsiders were a team of heroic metamutants. Presumably, both Kokoro (Tatsu Braddock) and Haloroma were members at one point. The Mutant Outsiders is an amalgam of the New Mutants of the Marvel Universe and the Outsiders of the DC Universe. The Tyrannoids are a group that inhabit the European nation of Latkovia and have battled Kokoro (Tatsu Braddock) in the past. It is unknown whether they have any affiliation with Dr. Doomsday (Victor Von Doom), the ruler of Latkovia. The Tyrannoids of Latkovia are an amalgam of the Tyrannoids (the servants of Tyrannus) and Latveria of the Marvel Universe and Markovia of the DC Universe.